I couldn’t wait to read this book, and it certainly didn’t disappoint. I couldn’t put it down, and read it within 48 hours! Jane Hughes is living what could be referred to as a ‘small’ life in a quiet region of Wales. She loves her job in an animal sanctuary, and is enjoying what could be a potential long-term relationship with the lovely Will. But Jane has a past that she has done everything in her power to hide. Jane isn’t even her real name! Told in both the present tense, and in flashbacks to the horrific events of 5 years ago, we learn Jane’s story. 5 years previously, Emma (now Jane) is a fairly average 20-year-old. She hates her job but she loves her friends: dynamic Daisy, volatile Al, and the quite aggressive Leanne (who she’s actually not overly fond of, but who falls within their circle). The girls have been friends since their university days and form a cohesive group despite (or maybe because of) their individual weaknesses and failings. To help Al get over a particularly upsetting break-up, the girls decide to go to a retreat in Nepal. They anticipate that it will be the holiday of a lifetime – something they envision they can always look back on, reminiscing about the fantastic time they had. Not surprisingly, it doesn’t exactly turn out like that. When they reach the mountain-top retreat of Ekanta Yatra they meet the charismatic Isaac and his team. They don’t exactly form a cult, more like a hippie commune, but Emma is immediately alerted to the fact that something doesn’t quite feel right. Unfortunately by the time she decides that she needs to do something about it, they are stuck on a Nepalese mountain, in rainy weather that prevents them from leaving. 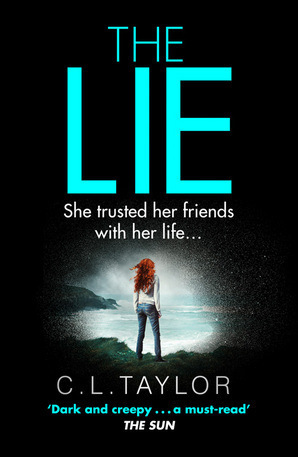 Taylor cleverly and intricately deals with the age old art of manipulation and mind-games. Who should the girls believe? Who’s telling the truth? What are the inhabitants of Ekanta Yatra hiding? The story twists and turns, as the cracks in their friendship widen. Each chapter ending on a cliff-hanger which only makes the reader determined to keep reading. It also insinuates itself into the reader’s head, leading one to ponder on who you’d want to be stuck in a remote location with; which of your friends would really have your back when push comes to shove? It’s chillingly disturbing. You’ll automatically find yourself looking at which characters you identify with. Some you’ll automatically empathise with, while others you might immediately dislike. You quite desperately feel that you need to ‘take sides’ here, but are never quite sure which is the right one. The book forces you to ask what you’d do in a similar situation. One would like to believe that you can completely trust your friends and vice versa, but hopefully you never find yourself in circumstances like these, because maybe it’s just easier never having to find out! The day after I finished this book, we were all shocked to hear of the devastating earthquake that struck Nepal. I found it coincidental (although many believe that coincidences just don’t happen) that I’d just finished a book based in that very area, and Emma’s feeling of desperation at being isolated on a remote mountain resonated with me even more than it had previously. This is a highly recommended, gripping read. great review 🙂 i loved this book, cant wait to read The Accident by the same author. Thanks for such a great and enthusiastic review. I have just bought this one and can’t wait to read it.